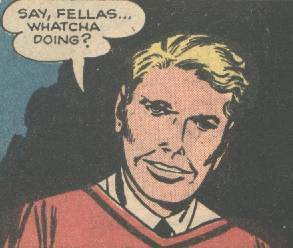 Usual means of access: Via a "Trans-Dimension Machine"
History: (Tales Of Suspense I#23) - John Cummings was a curious young lad who was always asking questions. One day while he was walking along, he saw some workers digging in the street. When he asked them why, they angrily refused to answer and yelled at him to go away. Now really curious after their secretive manner, John spied on them from the top of a building with binoculars. He saw them descend into their newly dug pit and then fade into thin air. Amazed, and now determined to get to the bottom of all of this, John headed to the pit and climbed down inside. As he reached the base of the pit, he felt himself begin to vanish as well. Soon he vaporized completely, his molecules being reassembled in another universe. When he became conscious again, he found himself inside a giant machine, the purpose of which was to transport things across dimensions. He also immediately discovered that his body had been re-formed into an almost two-dimensional, flat form. Exiting the machine, John was astounded to see that he was in a different world, one where everything was flat. Cautiously searching the city, he caught sight of some green-skinned, flat beings wearing workers clothes and carrying human facemasks. John overheard their conversation, and learned they had constructed a trans-dimension machine for the purpose of invading Earth. Using their human disguises they planned to infiltrate human society, while secretly conquering humanity. Suddenly the 2-D mens warning light went off, revealing Johns presence. As John ran away, they fired electro-currents at him, but John managed to dodge the blasts. The 2-D Men then whipped out the tiny Hypno-Creature and exposed it to some special fumes. The Hypno-Creature grew to gigantic size after exposure to the vapors and then chased after John. As John dashed into the Valley of Crystal, the Hypno-Creature prepared to defeat him with its hypno-ray as the 2-D Men watched with glee. However John seized a chunk of crystal and reflected the hypno-ray back into the eyes of the Hypno-Creature and the creature hypnotized itself. John ordered the creature to attack the 2-D Men as a diversion, while he ran to the trans-dimension machine to get back to Earth. Once there he took control of a parked steamroller and filled the pit with rock, destroying the trans-dimension machine hidden there. This story was re-printed in Fear I#9 (August, 1972). The dimension in question was only referred to as "The Dimension of Doom" in the title. flat. I refer to them as the 2-D Men just because that the name sounds cool. Youd think that the 2-D Men could have rebuilt their trans-dimension machine and tried to conquer Earth again by now. 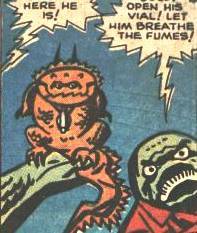 Perhaps they could use some other method of inter-dimensional travel like the Nexus of All Realities in Man-Things swamp. As for John Cummings, he couldve grown up to become a paranormal researcher or something. He could investigate strange disappearances, U.F.O abductions, and extradimensional activity. I'd like to think that these pre-Marvel horror and monster stories took place in the pre-modern era, usually around the date they were published--Snood. 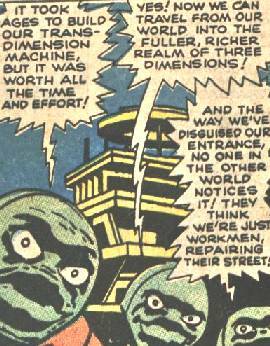 Maybe the 2-D Men of the Dimension of Doom have some connection to Kalahia, an other-dimensional city of scientists who could transform themselves into a two-dimensional state -- this city was discovered by Bruce Dickson, who learned this ability and went on to become the Thin Man in Mystic Comics#4 (August, 1940). Or any other dimensions or things concerning Doom or Dimensions. John Cummings was an inquisitive teenager who uncovered the 2-D Mens plot to conquer Earth after finding their "trans-dimension machine" outlet in the pit. He later destroyed the device with a steamroller, making it impossible for the 2-D Men to travel to Earth (or at least not for a long time). 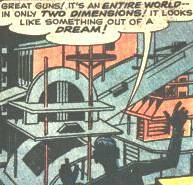 The 2-D Men were the inhabitants of the Dimension of Doom, and were flat. Somehow they discovered the existence of Earth and spent years building a machine to allow them to cross the dimensional barrier to conquer Earth and the surrounding universe. They wielded weapons like the electro-currents and the Hypno-Creature. The Hypno-Creature was a relatively small, harmless creature, who when exposed to special fumes stored in a vial worn around its neck, would grow to enormous size. Using its hypno-ray it could defeat virtually any opponent, but the creature itself was not immune to its own ray. It is unknown whether the Hypno-Creature is unique or whether there are many hypno-creatures living in the Dimension of Doom.